Click on any photo to see larger version. 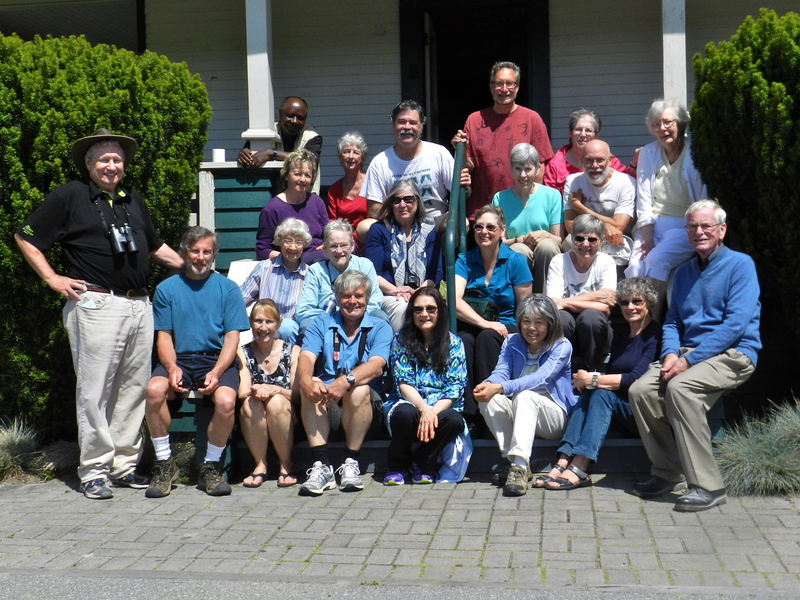 It was a gorgeous Wednesday morning as 21 participants left Cammidge House (CH) at 9:00 a.m. on the Delta Nats quarterly Birds on the Bay outing in Boundary Bay Regional Park. Species hi-lites were slim, but the Marsh Wrens and baby Mallard families were popular, and our Photogs, Terry, Ken, Marion, Jonathan and newbie Glen got some super shots which you can view on our DNCB Picasa site. 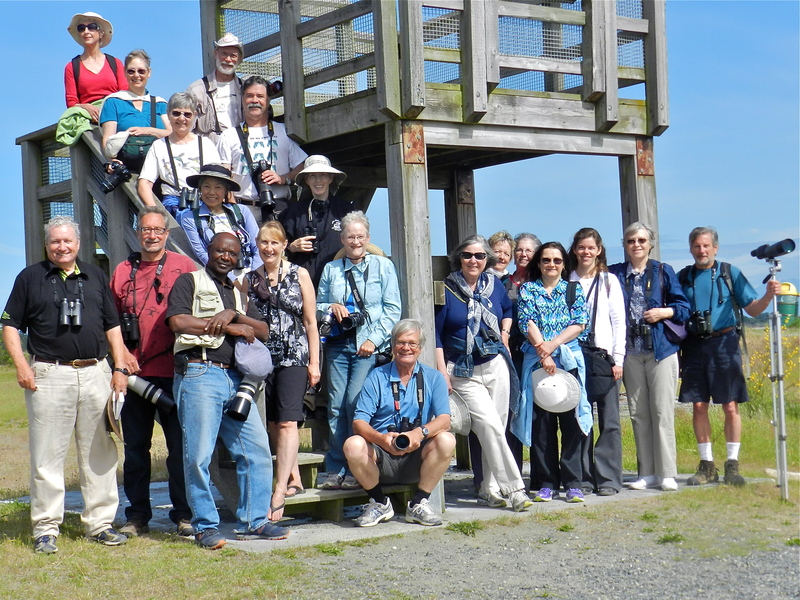 Of the 24 total participants on the day, about 15 were newbies to the Delta Nats Casual Birders fold, some from afar, in BC and even the USA. Time-challenged Marion joined us at the beach, and Delta Nats ladies Jennifer and Eleanor served us their scrumptious home-made goodies at Cammidge House following the walk. 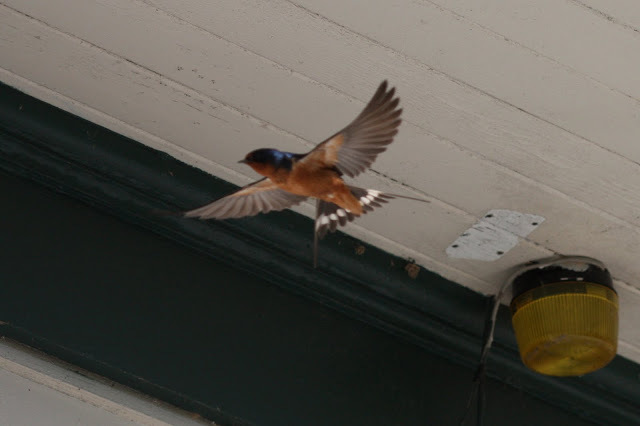 As we were leaving Cammidge House, it looked as if Barn Swallows were surveying possible nesting spots under the eaves. We’ll check this out in the future. 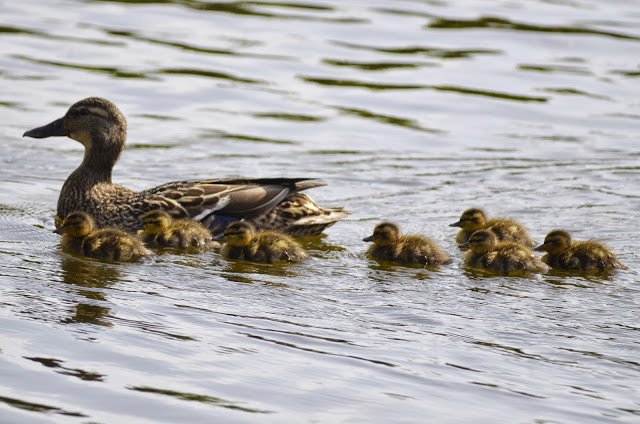 A mother Mallard herded her 9 ducklings to cover in the slough beside the road. This was the first of several new families of ducklings seen today. 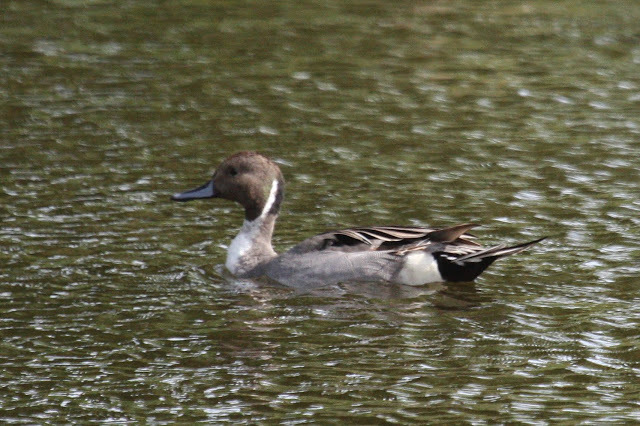 At the pond at Centennial Beach a few Gadwall were among the Mallards, along with one drake Northern Pintail. 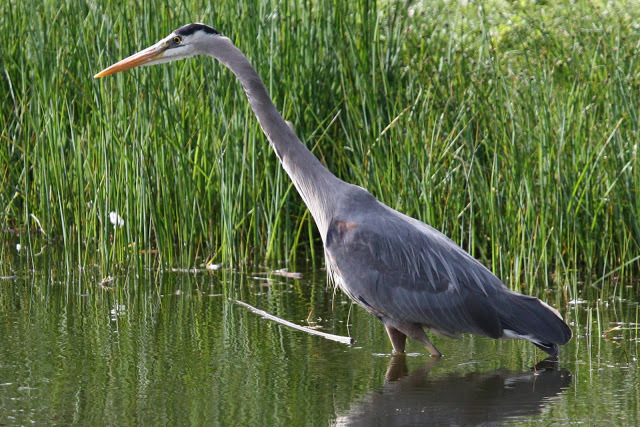 A Great Blue Heron (GBH) posed nicely as Red-wing Blackbirds screeched around us. We walked across the beach to the shoreline and returnee-to-the fold, Scope Bearer Ron, scoped the Bald Eagles, GBH’s and Gulls in the distance as the tide was way out. 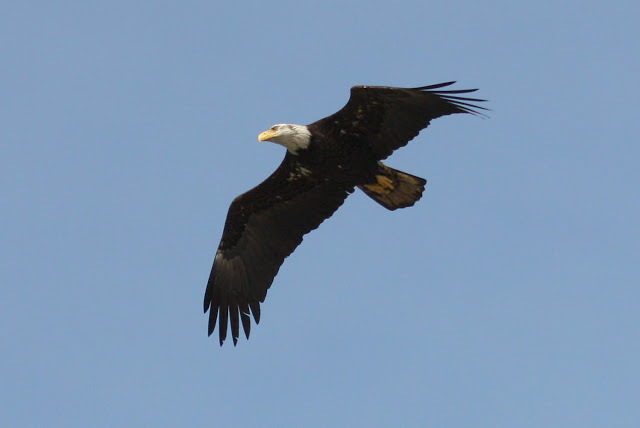 A nice adult Bald Eagle made a low fly-past above us as if on cue. Unfortunately, and unusual in BBRP, no Shorebirds were seen today. 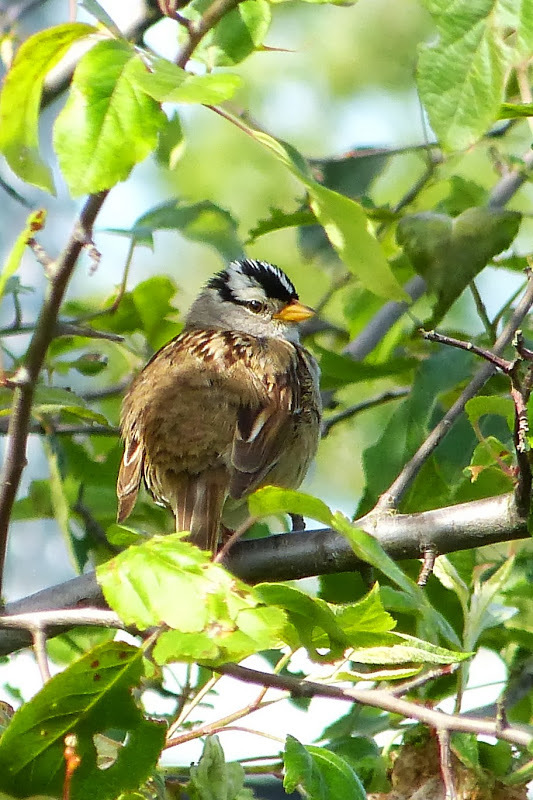 We started our trail walk at the new Concession Stand where White-crowned Sparrows flitted in the adjacent bushes. Savannah Sparrows were everywhere and Song Sparrows were quite common too. We heard Common Yellowthroats, and some saw one or two. Tree Swallows were hawking insects in much of the Park and we also saw a couple of Violet-green Swallows. Hopefully some of the Tree Swallows have taken, or will take up residence in some of our Delta Nats 28 nesting boxes in the Park. We wandered in various small groups (the Leader almost lost control, but didn’t) to the Lookout Tower where Ken took the obligatory Group Photo. 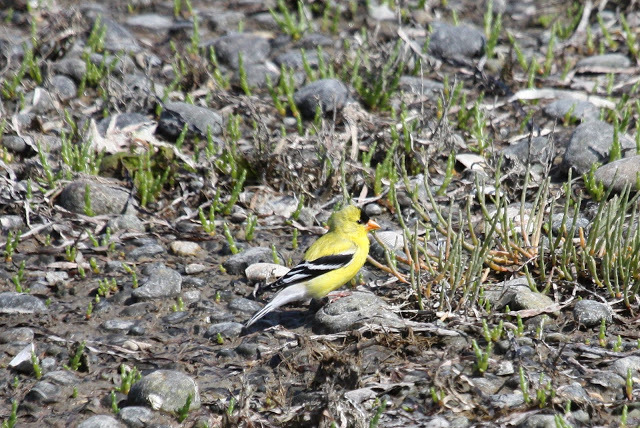 Nearby, brilliant American Goldfinches satisfied a few of the candy birders. Several Brown-headed Cowbirds around too. We followed the shoreline path to the Pump House, searching in vain for shorebirds or other interesting waterfowl. An adult Bald Eagle caught a flounder and entertained us with it in his claws on a pole, then departing after being mobbed by some Crows. A Black-headed Grosbeak was heard and some saw a Caspian Tern fly by. We followed the inland trail back to Cammidge House. Several Northern Flickers around, and small flocks of Cedar Waxwings and House Finches made appearances. 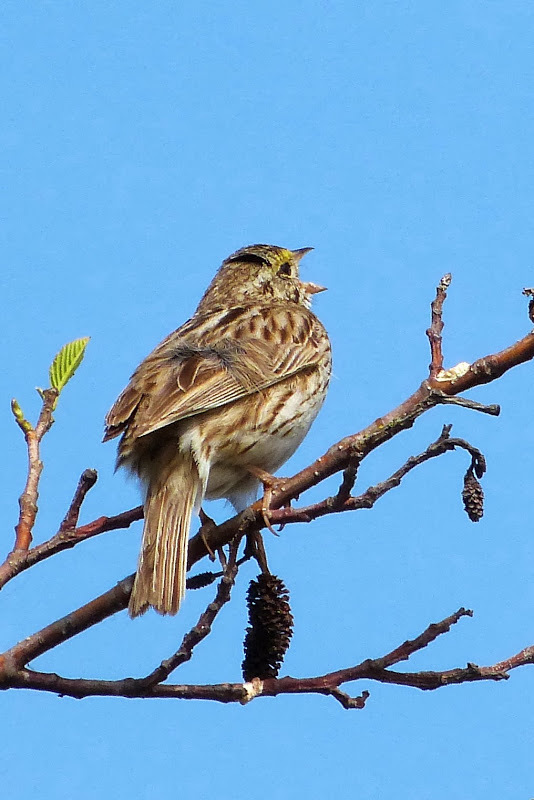 We were even entertained by common sightings of Spotted Towhees, House Sparrows and American Robins. 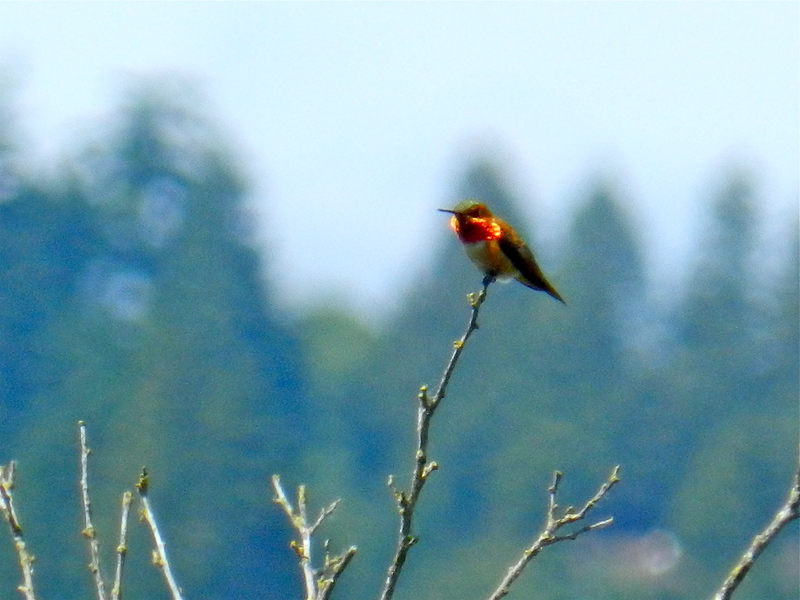 Some saw, and photographed, a beaut male Rufous Hummingbird. 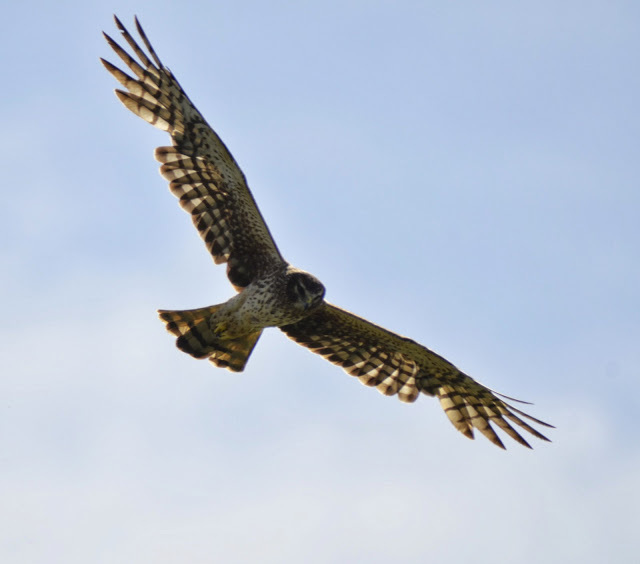 While we were lamenting the lack of raptor sightings, a Northern Harrier arrived, again on my cue, and circled above us. We noticed her patchy, missing wing bits which we thought might be due to moulting. 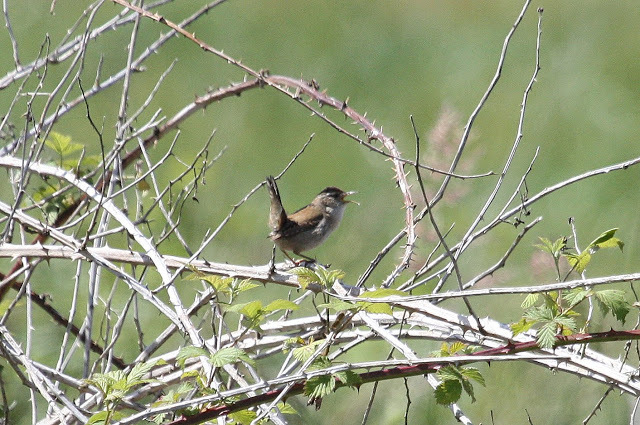 We heard lots of Marsh Wrens buzzing, and finally our patience was rewarded when a couple of them posed on bulrushes for photos. We arrived back at Cammidge House as instructed at 11:30 a.m. where Don & Rochelle and the other two Delta Nats ladies, Jennifer and Eleanor welcomed us with their tasty tidbits, all home-made with love. Ken, with Don’s astute guidance, took another standard BOTB Group Photo on the CH steps which seemed to annoy the newbies as it encroached on their feeding time. They were obviously more interested in wolfing down the goodies, especially Sandra’s egg salad sandwiches, Eleanor’s ginger cookies and Jenn’s scones. Although we were not blessed with any special species sightings today, it was a very enjoyable morning outing with some new fresh birders, some of whom bordered on being interesting. Next Wednesday, June 12, the DNCB outing will be to Pitt Lake (aka Grand Narrows or Pitt Polder Park), leaving Petra’s at 7:30 a.m. For those meeting us in the parking lot at the Park entrance, I expect to be there around 8:45 a.m.
Don’t forget our monthly Delta Nats meeting next Monday, June 10 at 7:30 p.m. at Cammidge House. It’s our AGM and Members will be giving short presentations on subjects of their choice. All welcome. 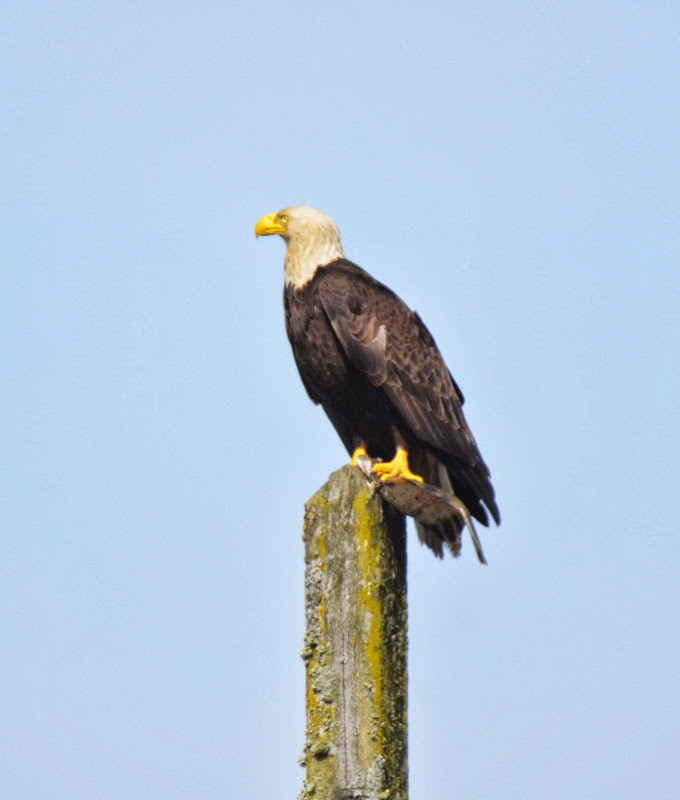 This entry was posted in *DNCB, Bald Eagle, Birds-on-the-Bay, Cammidge House, Centennial Beach, Northern Harrier. Bookmark the permalink.